I've been working on a new blog to share and organize my recipes - bcmom's kitchen. As I started posting recipes there, I realized that people might want to be able to print the recipes. I might even want to print some of these out. Sometimes I just open the recipe on my computer and then go back and forth between the kitchen and the computer - not very efficient. Or I'll scribble the ingredients on an old envelope or something. It works, but still not ideal. Printing a recipe from a blog isn't very efficient either. For instance, I just did a print preview for my Cinnamon Roll recipe, and I ended up with 4 pages. Only one of them had the actual recipe, so I suppose someone who wanted to print the recipe could print just that page, but why should it be so complicated? I need a separate, simpler, printable page. 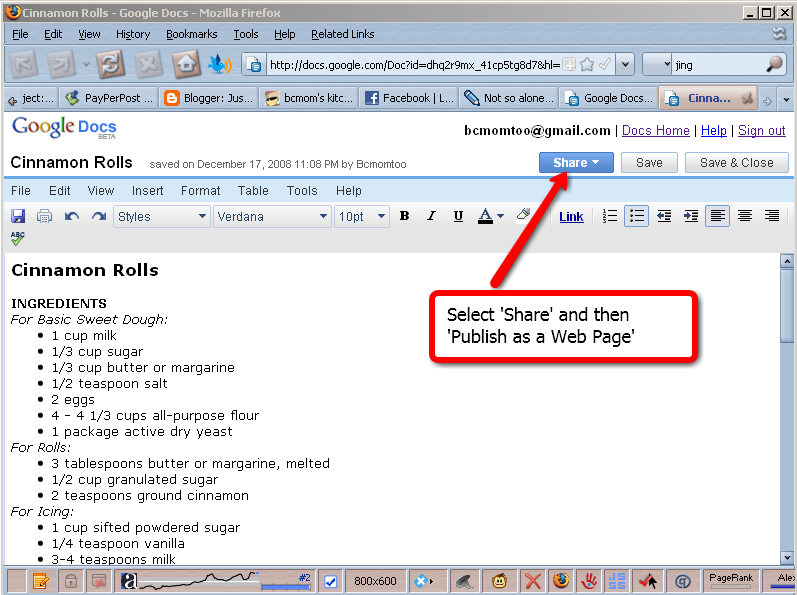 I'm planning to create and publish one of these Google Docs for all the recipes I post on my blog. Hopefully that means more people will be trying my recipes, or at least printing them out with the intent to try them. I think your blog is great and I was so excited to read your article about printing recipe pages. I tried it but it just does not work for me! I wonder what I might be doing wrong..... once I have pasted the google link into my blog I get the ERROR message saying: unacceptable characters in link. I wonder if this happened to you. I would be really grateful for some help. Cheryl - I'm sorry I don't know how to help you. I've never had a problem. 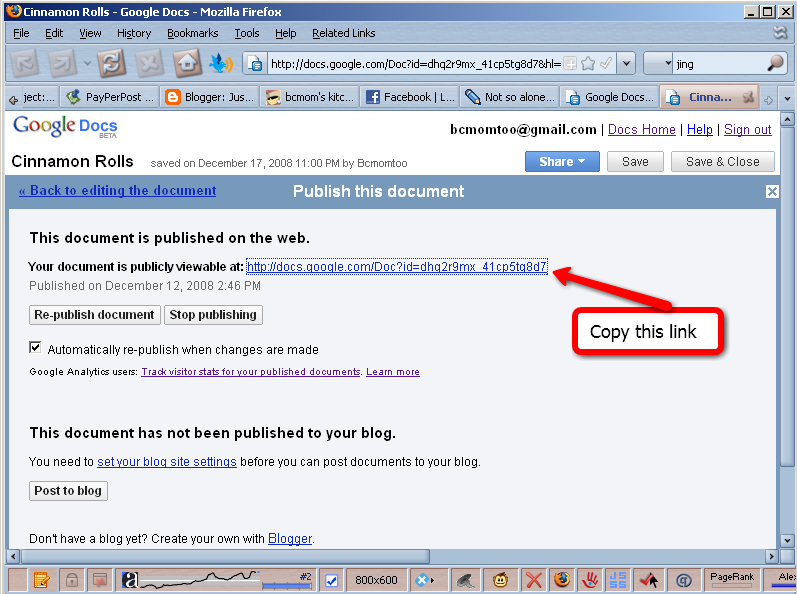 Once I publish my Google Document, I just copy the link they give me, add it to my blog, and it works. I just tried another one yesterday to see, and it worked fine. If I think of anything, I'll let you know!